Rock band The Who have recreated their legendary 1970 Leeds University concert to launch a European and US tour. 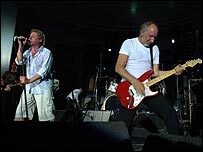 Singer Roger Daltrey and guitarist Pete Townshend, the two surviving original members, also unveiled a plaque at the university to commemorate the gig. The Live At Leeds recording of the original show is still considered one of the best-ever live albums. Other tour venues include Germany, France, Spain and Austria, with US dates starting in September. 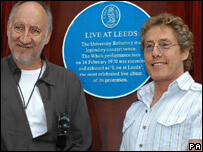 While unveiling the plaque honouring the 1970 concert, Townshend and Daltrey both paid tribute to their fans in Leeds. "It's so great to be back. I haven't been here for ages and I love it in Leeds," said Townshend. Daltrey added: "Without those unions to play, the venues were thin on the ground, so my big thanks to Leeds and the others for being there." The 1970 gig came after The Who's triumphant appearance at Woodstock and included the last complete live performance of the rock opera Tommy. The idea to recreate the gig came about after broadcaster Andy Kershaw - who was the entertainments secretary at the university in the early 1980s - approached the band's manager, Bill Curbishley. Kershaw wanted to know if the band would unveil a plaque commemorating the gig, and asked if they would also consider performing. "Bill finished my sentence: 'They'll do it.' And so the idea of a concert began," he said. "It defined an era of big bands like The Who playing at college venues and also underpinned the importance of college venues and the live music circuit."